Cath, Thomas and Frances were at Castle Kennedy gardens at 10am to meet the other walkers: Jacqui, Mary, John, Duncan, Irene, Margaret, Audrey, Ken, Mary Sloan, Richard, Andrea, Robert, Gordon and a new lady from near Port William, Anne. I did a scone count and went into the tea room to ask them to put 8 aside for us for later. Allan Leiper was supposed to have led the walk but was unavoidable detained elsewhere! 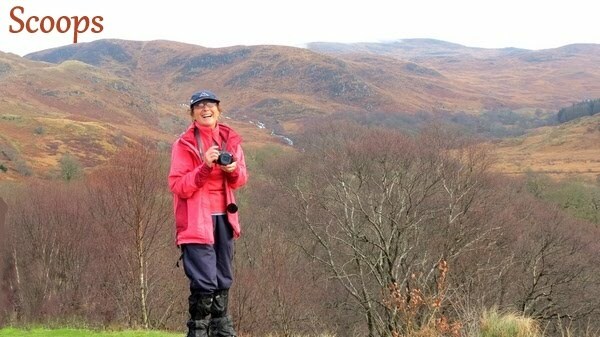 Cath agreed to lead the walk backed up by Richard who brought along his map too! Saturday morning was bright and sunny with only a few clouds sailing across the largely blue sky. Seventeen ramblers assembled under the trees at the Castle Kennedy gardens car park. 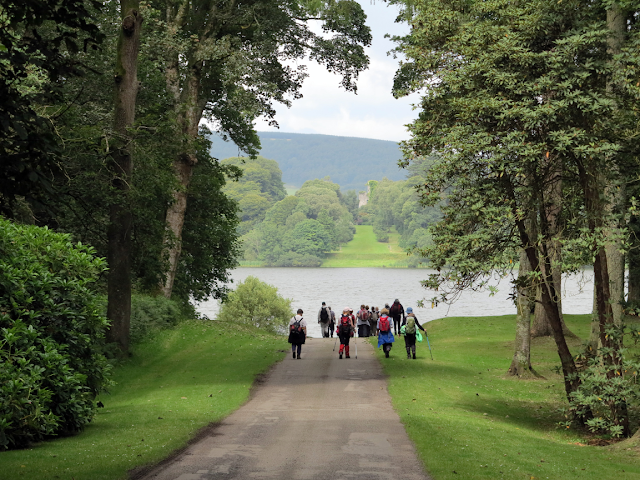 The group set off away from the gardens along the Estate road. They turned off along a path through the woods around the south-eastern corner of the Black Loch and turned back to the New Luce road. This was followed for a short distance until they reached the road leading to Sheuchan and Meikle Tongue below the escarpment of Sheuchan Hill. The track turned uphill into the woods around the slopes of the hill. Once they had crossed the Sheuchan Burn they turned back along the forest road through an area of recently thinned conifers. The sharp tang of the recently cut logs stacked along the roadside added to the moist smell of the woods. The machinery had turned the road rather muddy but it was soon passed. 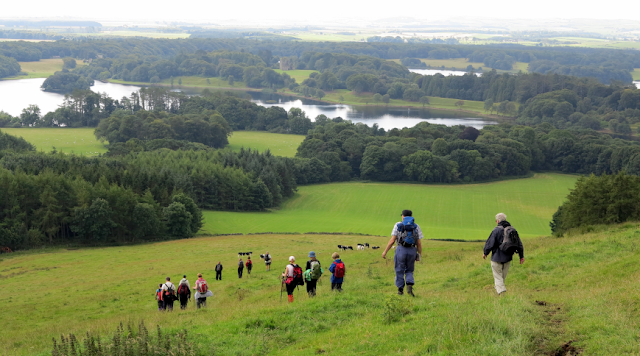 The route then reached the open fields with views across the woods and lochs of the Estate. 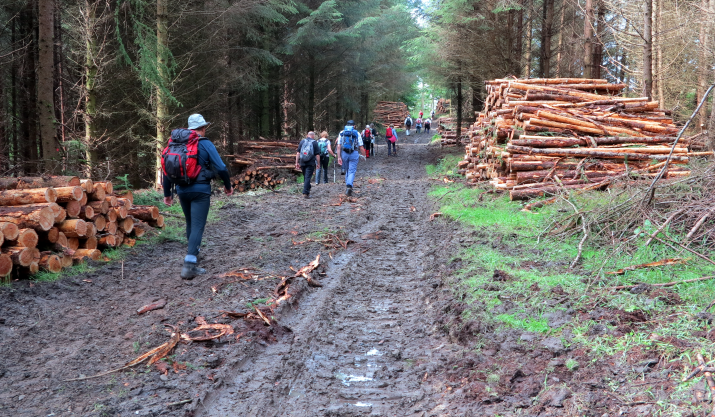 The track followed the contour below the woods past Cullurpattie and on towards Balker Farm. 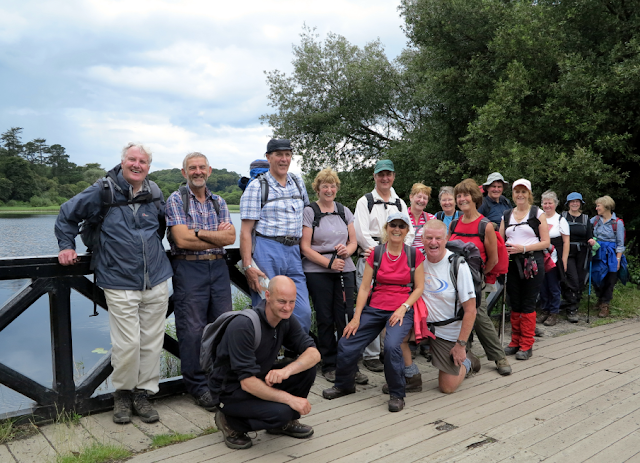 At Balker the ramblers were greeted vociferously by several dogs who were surprised to see such a large group. Their owner soon silenced them as the group paused for a short chat. Beyond Balker the track climbed gently. Along the way they paused to examine a well set in an alcove in the wall. A small plaque identified the date as June 1931. It was Allan’s plan to go up to the mast from where we would get great views and we could have our lunch. Well, after following the road past various buildings and then getting clogged down in mud as we walked along a track churned up by logging machinery, we started to climb up a good track towards the mast. Beyond the well the walkers turned right up a track which climbed through the woods to the aerial on the edge of the moor. Further thinning work had been carried out in the woods and piles of logs for the sawmills and small roundwood for firewood lined the track. Above the woods the track crossed rougher moorland and climbed along the edge of the wood to the mast with its numerous aerials and equipment cabins. The group had intended to pause here for lunch but the growth of the trees had obscured the view and the midges were enjoying the damp air hemmed in by the trees. 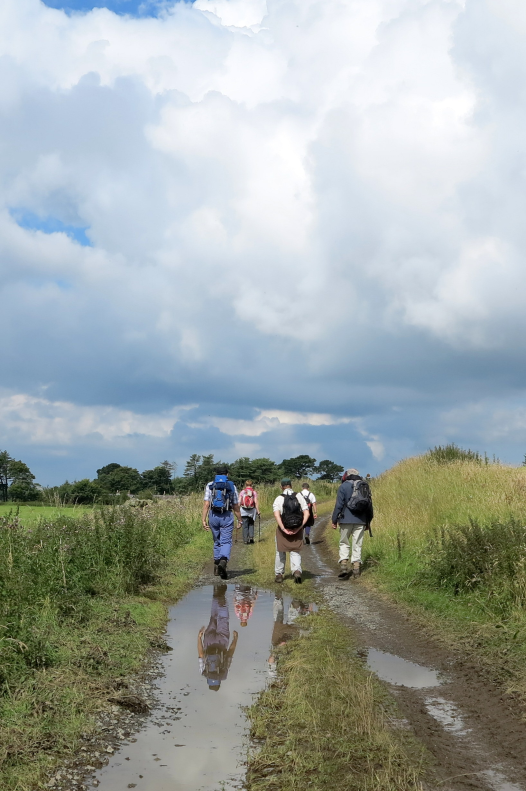 The ramblers decided to seek a better area and continued across the moor until they reached the open fields above Meikle Tongue. 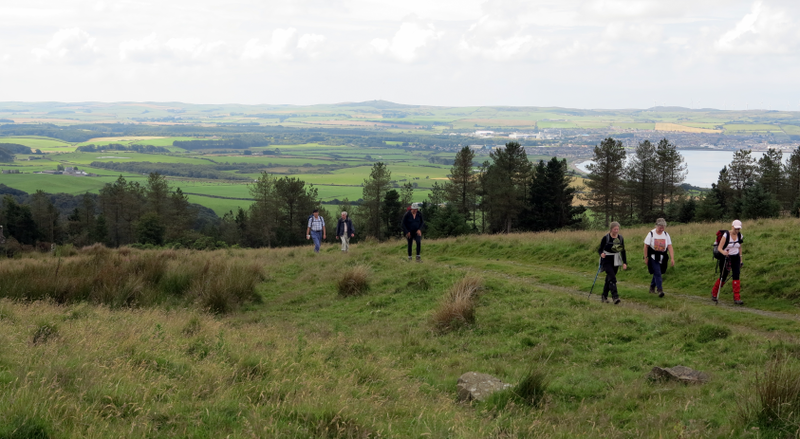 Here they found a grassy bank with lovely views over the Black Loch to Castle Kennedy and the sea beyond. A slight breeze kept the midges at bay. A rumble of thunder and a few spots of rain drew attention to the dark clouds amassing to the north. 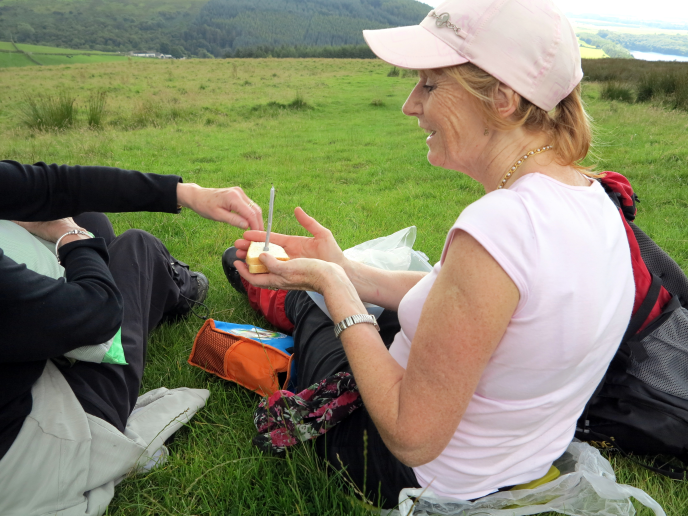 Fortunately we only got a very light shower despite the thunder clattering behind us and Margaret got to blow out her one birthday candle which I had stuck into her sandwich and tried to take a photo before the wind did the job for her. After lunch they descended the steep brae and followed the track back to Cullurpattie. After the houses they turned down through the woods towards the bridge over the tip of the Black Loch. After pausing to admire the water lilies on the loch they climbed to the Estate road leading to Lochinch Castle. They turned away from the castle and followed a rough track between the fields of grain until they reached the woods. Once they reached the main belt they turned south along an attractive but muddy path through the wood until they reached another track. The group took this route past some friendly miniature ponies until they reached the main drive. 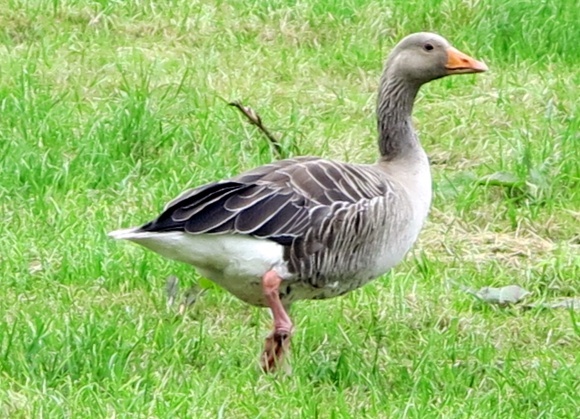 A single Greylag goose was grazing in the field next to the drive. Others could be heard honking on the loch below. A short way up the drive the ramblers turned down towards the old Inch Church and graveyard. The ruins were well overgrown with ivy and rhododendron and many of the old and ornate gravestones were hidden amongst the vegetation. 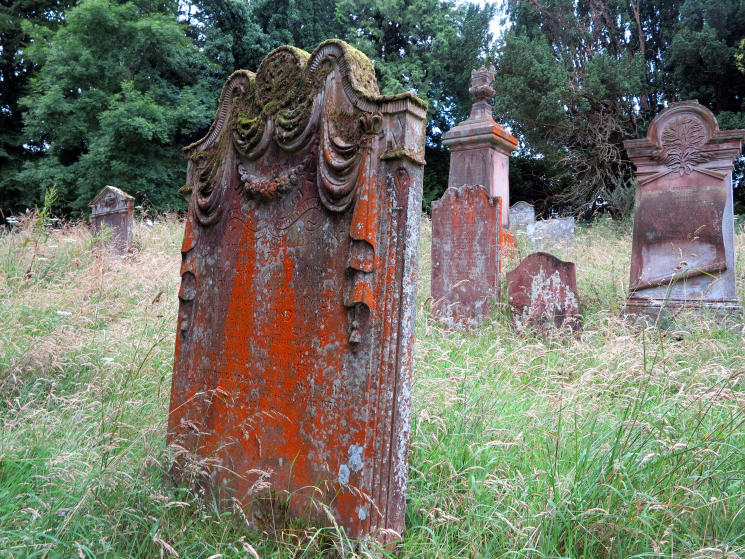 I enjoyed spending a bit of time in the old cemetery with its derelict church – many members of the Dalrymple family are buried there, the last seeming to be in 1996, but the area is vastly overgrown, which surprised me. 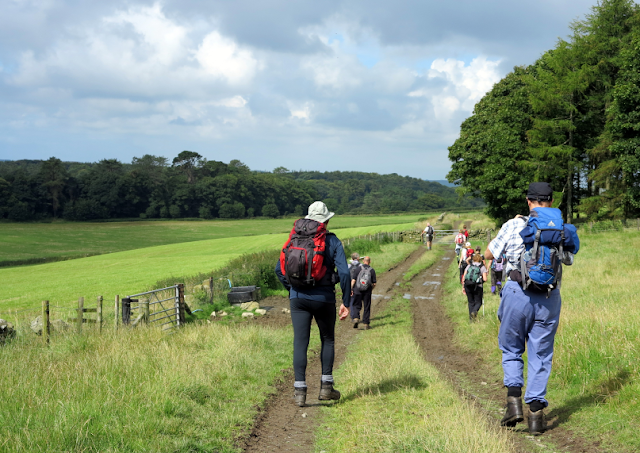 After crossing the graveyard they followed the old track which was marked only by shallow depressions in the field. On reaching the woods they turned eastwards until they reached the Castle Kennedy drive. As they walked back along the drive they had fine views over White Loch to the ruins of the old castle and a distant view of the current one. Unfortunately the rain decided it had waited long enough and proceeded to deluge the group as they hurried back to their cars. I was really flagging and cadged a couple of jelly babies off Richard which gave me a quick sugar boost and then we came to the main drive down into the garden. Soon afterwards it started to rain in earnest and waterproof jackets were donned for the short section left to walk back to the cars. The day was concluded with welcome tea and scones in the tearoom before the group dispersed. We had a quick footwear change before most of us piled into the tea room (not Gordon who had a bus to catch). We all laughed a lot and enjoyed a longer than usual chat before leaving. While we were in there the rain bucketed down but eased off as we were about to leave.